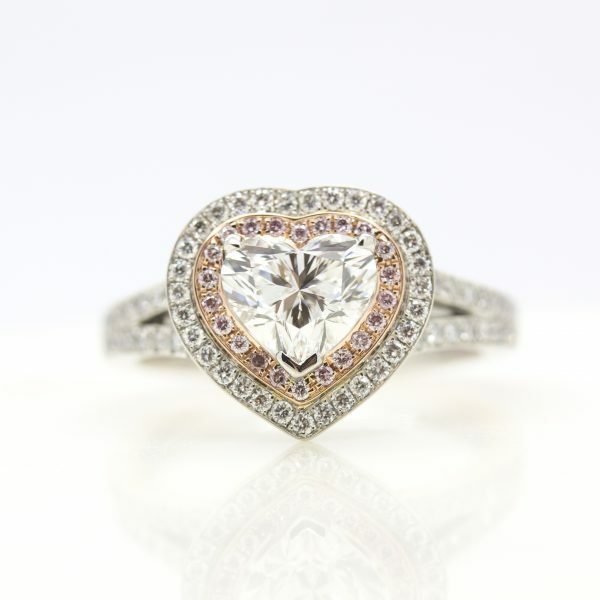 Hearts are one of the most popular fancy cuts and that tradition hasn’t changed in over 600 years. In the 15th century, heart cut diamonds were gifted by royalty as a sign of friendship. Even Mary Queen of Scots once sent a heart-shaped diamond ring to Queen Elizabeth. What is a heart shape diamond? As its name suggests, this diamond is in the shape of a heart and is the ultimate symbol of love and romance. It’s a fancy cut and contains 56-58 facets that capture and reflect light, resulting in visible brilliance. The wings of the heart should be symmetrical, with a graceful curve that provides excellent fire, ending in a neat apex point. 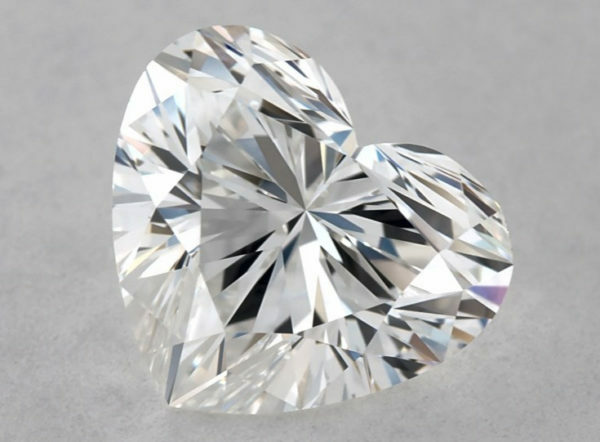 What factors should I consider when choosing a heart diamond? Heart diamonds look their best when they’re above 0.50 carats – anything below will make it hard to identify its recognisable shape, especially once the stone is set. Symmetry is incredibly important to consider when choosing a heart diamond. It’s vital that the two halves of the heart are identical and the heart’s cleft is distinct and even. This regal cut requires a great deal of skill and precision to create. Because of this, it has become a prized stone, one that remains a popular gift for lovers. For the ultimate romantic, the heart shape is a must! When choosing a heart shape, pay special attention to its overall shape and the symmetry of the curved parts. Ratio is particularly important on a heart shape diamond–ideally between 0.90 and 1.10. This will make your heart as tall as it is wide, for the perfect heart proportions. Heart diamonds don’t officially have a cut grade. 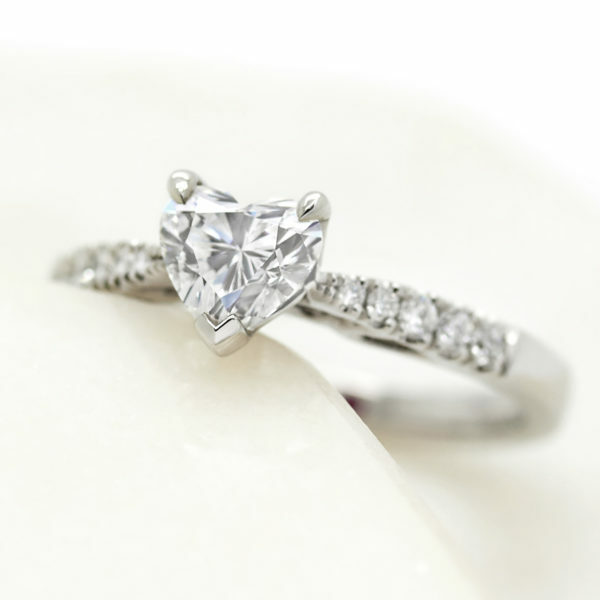 However, there are a few guidelines that will assist you when it comes to choosing a heart shaped diamond. What is the best colour for a heart diamond? Evaluating colour in heart cut diamonds is entirely dependent on the preference of its buyer or wearer. Diamonds in the colourless range (D-F) carry a premium due to the fact that they are incredibly rare, but the truth is, the difference between the colourless and near colourless grade ranges is difficult to perceive, especially to the naked eye. What clarity should I choose for a heart cut diamond? When diamonds are formed deep in the earth, they develop clarity characteristics–slight irregularities visible under 10x magnification. Depending on the size, quantity, placement, tone or colour of these clarity characteristics, they may or may not be visible to the naked eye. This is one of the reasons why a truly flawless diamond is so rare. Diamond clarity is dependent on personal preference. Some may be happy with a diamond that features clarity characteristics that aren’t visible to the naked eye, while others desire a technically flawless grade and appearance. The choice is ultimately yours.